Be careful not to touch any hot part of the engine. 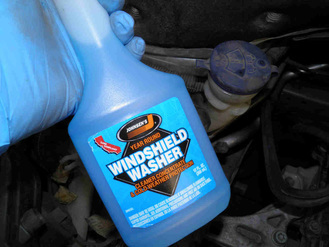 Never add water alone, always use a ready-made liquid or windshield wash concentrate. 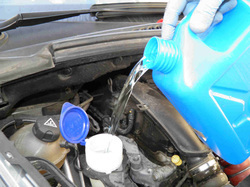 1- Empty any concentrate bottle of 200ml to 500ml into a clean container which capacity is between 1 US Gallon and 5 Liters. This will match most concentrated liquids. 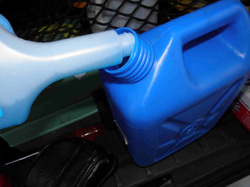 Fill the jerrycan with clean water (from tap, no need for distilled water). 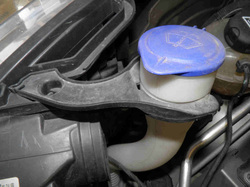 2- Find this blue cover with a pictogram showing a curved windshield and 2 water jets. 3- Fill the container and close well the cover.